It is quite common to film at higher shutter speeds when filming with a drone. At higher altitudes this really doesn’t cause issues because the terrain is moving by so slowly. However when flying closer to trees or the ground, this can cause a strobing effect on the footage that can be distracting. We can reduce this by adding realistic motion blur to our footage in Adobe After Effects. 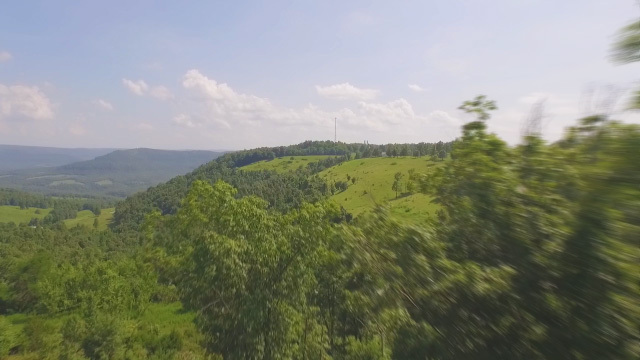 You will add the Pixel Motion Blur effect onto your drone footage, located under Effects>Time>Pixel Motion Blur. This effect looks at each frame of your shot, takes into account the “pixel motion” of your shot, and adds synthetic motion blur. You can leave the Shutter Angle setting at the default 180, or you can increase or decrease this to add more or less emphasis to the blur. To reduce shuttering from the pixel motion effect, I recommend setting the Shutter Samples setting to 8 or more. Tweak the Vector Detail setting to taste. Typically the default value of 20 works just fine, but if you get artifacts on your footage from the blur, you can increase or decrease this value to get different results. Another easy way to make drone footage more immersive is by using natural ambiance sound effects to go with your footage. Most modern drones don’t record any audio with the video (mainly because all you would hear is the drone buzzing!) but you can solve this issue with some peaceful nature ambiance. Quality is key here though so you will want to use high quality sounds such as this Peaceful Birds Ambiance or Wind in the Countryside. You can search out even more ambiance sound effects at AudioJungle.